So every year I do a Christmas dinner thing with my flatmates (which we’ve started having at lunchtime but I still call it Christmas dinner, I don’t know) where we get together for some good eating before going our separate ways. That’s all it was in 2006, the first year, but with my intense love for making feasts, it’s expanded into a bit of a mystique-surrounded juggernaut…I’d like to think. There’s usually some point – in this case, Thursday night – where a bit of frantic cooking happens. Which, by the way, is my idea of a Good Time. In case you were thinking “well she brought this on herself”. That’s right I did. 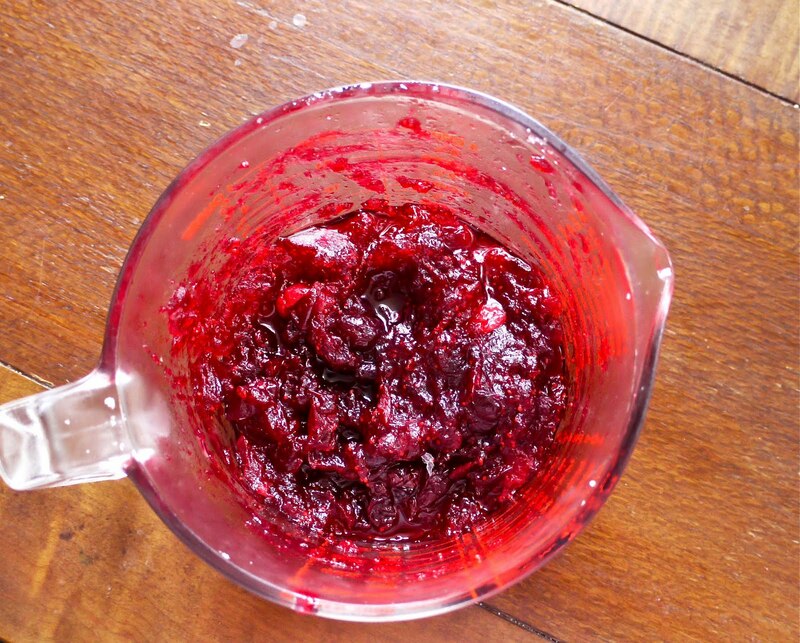 Nigella Lawson’s Redder Than Red Cranberry Sauce was the last thing I made before going to bed. Throw everything into a pan, bring to the boil and then simmer away for about ten minutes till the berries start to soften or disintegrate and release a lot of juice. Stir occasionally. 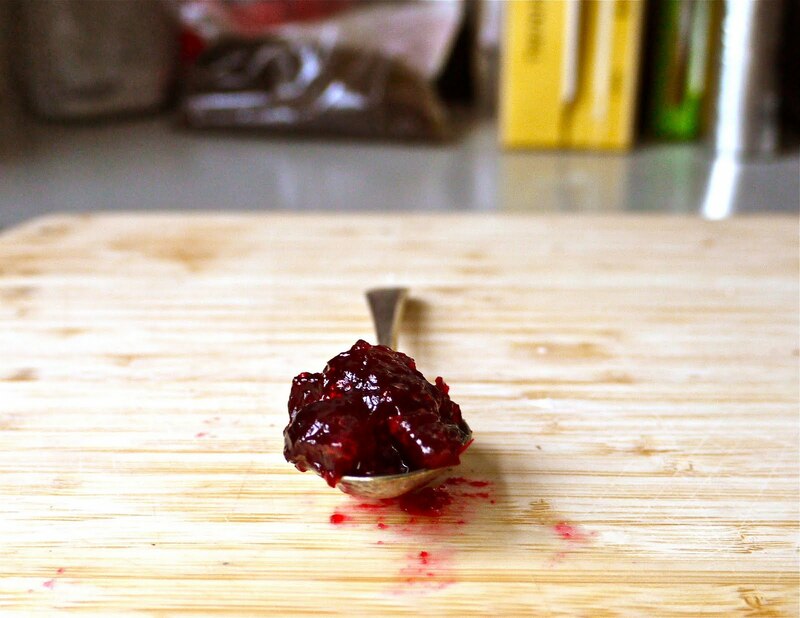 After about ten minutes, give a final aggressive, berry-breaking stir, then allow to cool slightly before pouring into a jug and refrigerating. When you get up the next morning (if you made it at 11.30pm like I did) it will have become as solid as jelly – that’s all the pectin in the cranberries’ round red bodies. 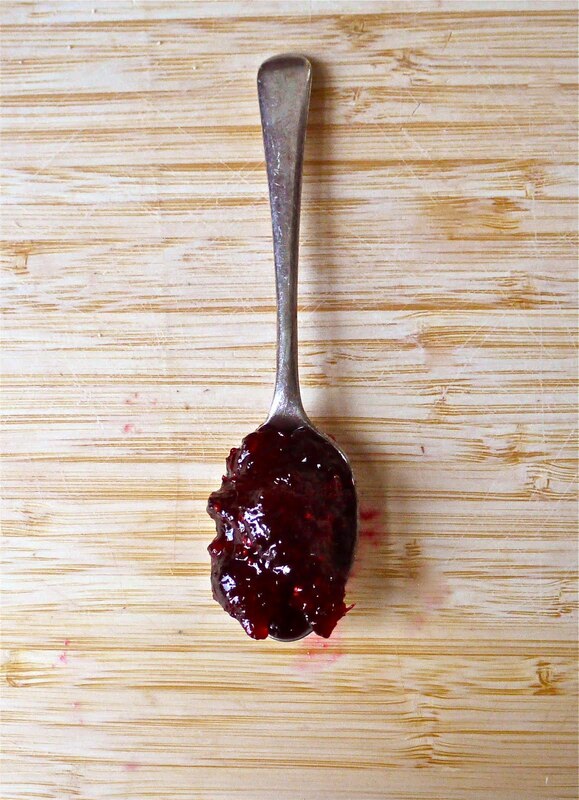 Give it a good stir before you use it and maybe thin it down with a tablespoon of hot water if you like, but spoonable cranberry sauce is just fine. Superfast blog post today – there’ll be a full rundown of the Christmas Dinner food on Sunday (or whenever I scrape together the time) though. Title via: Split Enz, I See Red from their album Frenzy…I accidentally just typed it as “Splut” which is actually kind of appropriate given the NZ accent. When I was a kid this was one of the songs Dad’s band covered so I’ve always been fond of it, it reminds me of Sunday afternoons when they’d have band practice in our garage. Brian D’arcy James (aka Burrs in The Wild Party…aka you’ve probably seen him in womens’ magazines posing with celebrities during his stint as Shrek on Broadway) A Michigan Christmas from his album From Christmas Eve to Christmas Morn. I was SO happy when I found out he had a Christmas album. This is the only track from it I can find on youtube, but I totally recommend the whole thing. His voice (and eyebrows) astounds. Nas and Damian Marley, Tribal War ft K’naan from Distant Relatives. Speaking of things that deserve capitalisation, I was SO SO happy when I heard the news they were coming to New Zealand – heard rumours from a reliable source a few months ago, but wasn’t counting on it coming to fruition. Not only are they coming to NZ, they’re doing a Wellington show too! I love it when acts do that – no flights to Auckland, no taking leave, no accommodation costs…Seriously good news all round. Next time: As I said, this is just a quick post…full rundown of the Christmas party, plus those vegetables I promised last time. Sounds like a great tradition to celebrate with the flatty mates before you all head off home, great idea, just like this sauce. Have a great dinner. Looking forward to hearing how the baked Alaska goes.. Soooooooooo 1970s. Have I mentioned that I can't comment on your blog from home since you changed the comment format? Irritating, because that is where I am when I read blogs!